​Digital Innovation: Australia’s $315b opportunity. 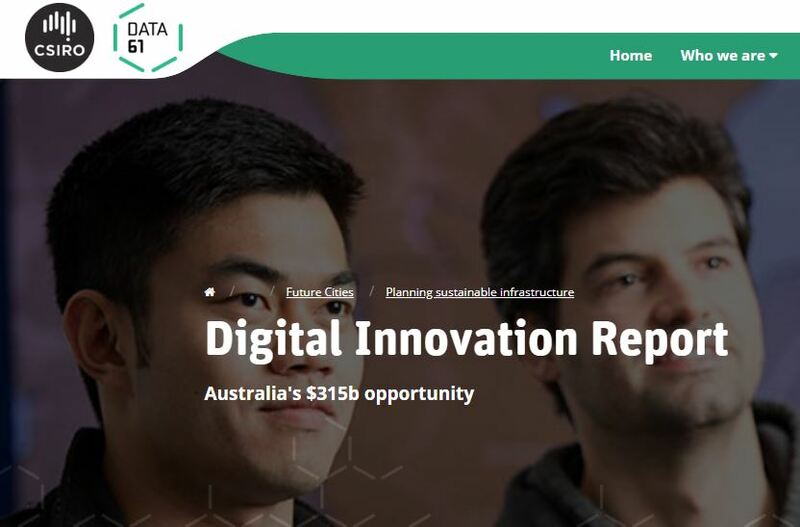 The new report from Alpha Beta for CSIRO/Data61, called “Digital Innovation: Australia’s $315b opportunity” identifies eight strategic areas where Australian businesses can succeed in creating new digital products or services. These opportunities are precision healthcare, digital agriculture, data-driven urban management, cyber-physical security, supply chain integrity, proactive government, legal informatics and smart exploration and production. Staff will be a big part of your business’ success – if you hire right. Staff can also be the hiccup or headache you don’t want. Research states that a bad hire costs ‘at least’ $25,000. But the pain goes beyond cash. In terms of digital innovation, have you watched the rise of HR & Artificial Intelligence (AI), and its potential? It is sometimes called #HRTech. For example, big corporations, like IKEA, now use a Russian start-up AI Robot to interview candidates for competence and skills. Quite a revolution. Obviously, it has some limitations. A big one that we noticed is that it only checks ‘competence’ not ‘character’. This is an important difference because research says that 1 in 4 fail pre-employment integrity testing. The flip side is that integrity is found to empower performance and prosperity. And that is the exact issue that was identified in the Innovation Report. ​In other words, society does not trade in loyalty anymore, it trades in trust.
. slow to process cases (eg. complex cases on average take 792 days, WWCW have 4,000 blue cards applications backlogged while those people still work with children).
. occasional police checks used by recruiters. National Police checks are used in some areas/sectors, but research has shown them not to be adequate to safeguard people and information, in of themselves.
. relaxed attitudes: finding a needle in the haystack is too difficult. Until you get pricked by the needle, that is. Imagine for a second that your organisation could readily access an affordable AI Vetting Officer? Imagine that you could have your shortlisted Candidates go through a background screening interview, identifying past counter-productive workplace behaviours, illegal drug use etc and then return a character assessment Result: “Favourable, Caution, Adverse” to you, the next day? Would it enhance your hiring decisions? Might it generate trust within your workplace as everyone had ‘passed’ the test? Could it exude trust to your customers and society in general? An “AI Vetting-As-A-Service” (VAAS) can do exactly that and much more. It is a product that will “accelerate decision cycles” from years and months down to hours and seconds. It also satisfies the requirement to be responsive and is evidence based. In contrast, an automated police check offers a fraction (1/21st) of the dimensions that a VAAS product covers. There is a lot of risk that remains unchecked – some use the illustration of hiring a ticking time bomb. Other black mark database check products (eg. WWCC) makes decisions with very little citizen involvement – therefore natural justice is either denied or delayed until an appeal or a court evaluates the decision (again lengthy delays and costs ensue for all parties). The difference with a VAAS product is that the citizen is a vital and essential contributor of the information, an important corroborator and is centrally involved in the process. In response to the low trust environment we find ourselves in, governments at all levels are scrambling to legislate, implement and coordinate more and more suitability clearances / integrity checks. eg. Working With Children Check (WWCC), NDIS Clearance, Airport (ASIC) Check, Elderly Persons Check, there is talk of GP & Staff to gain personnel suitability checks to have access to the Digital Health IT System etc etc). If trust is now society’s commodity of choice, then having a VAAS Suitability Clearance that the public sector, not for profits and businesses can access, will build confidence amongst citizens and the community at large. It will also generate the required trust by effectively screening malicious insider threats – by knowing, really knowing, the people you hire. Contact us today on (02) 61-71-41-71 to discuss your staff, contractor and partner integrity requirements, so you can join the Digital Innovation wave.